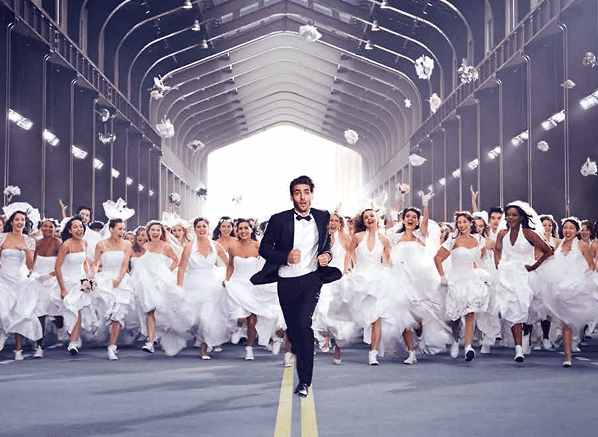 An army of amorous brides chase a practically terrified Jon Kortajarena through city streets in the advert for Guerlain’s latest fragrance, L’Homme Idéal Cologne, and who can blame them? After all, Kortajarena isn’t exactly harsh on the eyes now, is he? But these ladies (who are all Guerlain employees, FYI, and include a few Guerlain gents in the mix too because marriage equality is real, people) aren’t really chasing the handsome model, they are after the ideal husband and, more importantly, his fragrance. With last year’s L’Homme Idéal, Guerlain presented their idea of the ideal man – a cheeky yet suave woody gourmand that boasted more than a small nod to the house’s extremely successful La Petite Robe Noire. This time around, and for L’Homme Ideal’s first flanker, that naughty little scamp of a man has grown up a bit, gone on a diet and switched out his black tux for white linen. The result is a lighter version of the original that still maintains the almond signature that is integral to ‘L’Homme Idéal’. Click here to check out my review over at Escentual. Image via Escentual. Sample via Guerlain. I write for Escentual as their Fragrance Expert. My views are my own. Posted in Escentual, Flanker, Guerlain, Masculine, Perfume Reviews and tagged Cologne, Escentual, Flanker, Fragrance, Guerlain, Jon Kortajarena, L'Homme Idéal, L'Homme Idéal Cologne, Masculine, Perfume Review, Thierry Wasser. Bookmark the permalink.